People who are interested in Forensics are usually familiar with “The Body Farm,” a formerly clandestine plot of land at the University of Tennessee, where the decomposition of bodies is studied. Hundreds of people have volunteered their bodies after death to aid in this study, hoping the knowledge gained can be used in crime-solving, or for other benefits to society. Popular TV shows, like CSI, frequently mention facts garnered from this, and similar areas of study, in the fictional cases their episodes revolve about. 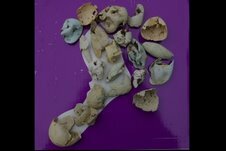 This research is an outgrowth of a branch of study called taphonomy. (taphos…burial, nomos..law) The science of taphonomy’s original interest concerned the forces that lead to and control fossilization. From its introduction to paleontology in 1940, taphonomy has spread its concepts through various other disciplines. I’ve combined many of those remnants with various natural oddities that I consider Natural Wonders to illustrate the dissonance created by the littering that is occurring in some of the most beautiful natural settings I’ve ever encountered, that is along the San Mateo Coast. This appraisal is generated not by homerism, as I live in Santa Clara, but rather by my frequent haunting of the incredibly varied, lightly touched, returning-to-wilderness South Coast that exists south of Half Moon Bay. Neptune’s Body Farm principles usually work like this. 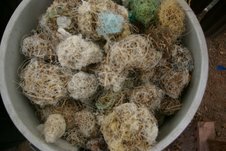 Because I have found so many golf balls in various states of degradation, I’ve been able to identify remnants that look less– and less– like anything normally recognizable as a real golf ball. Because of the broad spectrum of remnants in my collection, the vaguest hint of dimples in a scrunched piece of white plastic, or a small rubber band tip emerging from a twisted bit of shriveled plastic, or just the faint imprint the rubber band winding leaves on the inside of the plastic makes it easy for me to identify what it is I’ve found. But, it can also work another way. By finding the missing link between the unknown source objects and the unidentified objects in my collection, I can better understand the sequence of decay and identify the connection between both of them. Here’s the story of my favorite solution to a longstanding mystery in my collection. 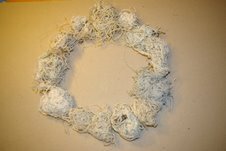 I have the “World’s Largest Fishing Line Ball,” (WLFLB), made up of some 3,000 pieces of fishing line knotted together, as well as three more full trash cans of line, still to be cleaned and tied to the WLFLB. All of those are monofilament line in clear, or shades of light green and blue. I also have a box of monofilament line in a rainbow of colors that I’ll eventually use in some other “artplay.” Finally, there is the box of miscellaneous balls of line. Some of the balls are twine or cord. Some are kite string. Some are fly fishing line. The majority of them are made of some strong synthetic fiber: Nylon? Rayon? Polyester? Or? I’d never been able to figure out what their point source was. It had to be something common, probably from the fishing or crabbing industry, but what? Well one day I found the “Missing Link” and everything became clear. Eureka! All those balls of line were from the body plies in tires that had been degraded. After time and tide have ripped the tires to shreds, the virtually immortal synthetic fiber wraps itself in a ball and travels along the near-shore bottom until it is spit out by Neptune’s Vomitorium. I just wonder if my “101 Tires,” project, which involves photographing, then disposing of tires that are making the same journey, is going to make these no longer mysterious balls of fiber no longer show up. If so, I’ve got the market cornered. 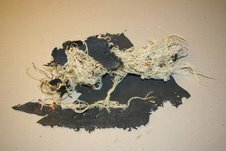 The body ply is a calendered sheet consisting of one layer of rubber, one layer of reinforcing fabric, and a second layer of rubber. The earliest textile used was cotton; later materials include rayon, nylon, polyester, and Kevlar™. Passenger tires typically have one or two body plies. Body plies give the tire structure strength. Truck tires, off-road tires, and aircraft tires have progressively more plies. The fabric cords are highly flexible but relatively inelastic. This entry was posted in John Vonderlin, Neptune's Vomitorium. Bookmark the permalink.